In our last two tutorials we’ve shown just how easy it is to customize the templates that are included with Xara Xtreme (in October scrapbooking and September a newsletter). This month we’re going to create a graphic from scratch, the heading shown on the left. If you don't have time to follow this tutorial and re-create this heading, then we have the solution for you! 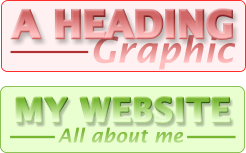 We've provided the .xar file below and you can just load and customize the heading to be any color with any text you want to create your own personalized version. So these are the steps you would take to create this heading from scratch. 1) Using the Text tool, create two separate lines of text. So just click on the page and type the words. Adjust the text size and position using the Selector tool. Select the required font - the example here uses Lucida Sans Demibold for the top line and Lucida Sans Demibold italic for the lower line. 2) Apply a graduated color shade: You should probably zoom in to do the next few stages - the quickest way to do this is to use the mouse scroll wheel while holding down the Ctrl key. Select the Fill tool, click on the top heading line to ensure it's selected. Now drag from top to bottom down the heading. Hold the Ctrl key while doing this to ensure the fill is exactly vertical. This gives it a white to black graduated fill. Bring up the Color Editor by pressing Ctrl+E. The end of the fill arrow is now selected, but we want to change the color of the top of the fill, so just press the Tab key to swap the selected end of the fill arrow (or you could just click the start of the fill arrow). 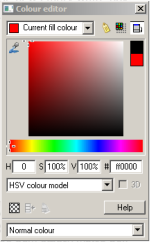 Now in the Color Editor, drag on the color picker to be bright red, top left corner. You will see the text now has a fill going from bright red to black. We want to make this color a Named Color, so that it appears on the color line and that makes it easy to change the color in future. So just click the label icon (as shown in the left hand image 3) on the top of the Color Editor and give the color a name, such as 'Heading Color'. The new Heading Color color patch should appear on the left end of your Color Line. You can right click on this and select Edit to edit the color at any time.